The recent uptick in pickup share comes as good news to beleaguered Detroit-based auto makers, who still owned 86.1% of the market in August. A languishing fullsize-pickup segment in the U.S. recently has shown signs of life while the once red-hot pace of small-car sales appears to be cooling. But it remains unclear whether sky-high incentives or another consumer-preference swing lies behind the mix shift. As pump prices for regular-grade gas reached a national record of $4.11 per gallon in July, according to AAA, consumers fled pickups and SUVs for smaller, more fuel-efficient passenger cars and cross/utility vehicles. Pickups started the year with a 15.2% share of the market and increased their hold to 16.2% in February. Meanwhile, small cars carved out a 16.3% share in January, falling to 15.8% in February. The sudden shift in consumer demand led the Detroit Three to radically realign their production mix, an effort underscored by thousands of layoffs and several plant closures. General Motors Corp. arguably made the most drastic cuts, including an unspecified postponement of its fullsize truck redesign. But since May, pickups’ share of the market has grown 4.1%, while through August small cars’ share shrunk 6.3%, Ward’s data shows. The push by pickups, as well as a 2.2% increase in SUV market share, came at the expense of small cars. Market share in all other segments remained flat, or down just slightly, August vs. May. A 1.0% decline in the Middle Car category represents the greatest downturn for the period. Gas prices also have moderated slightly. After a bump that accompanied Hurricane Ike Sept. 13., the nationwide average has settled to $3.68 today, although some parts of the country are seeing prices as low as $3.41. Meanwhile, consumer confidence rose in August, although most expect a weaker report in September due to the financial crisis. The recent uptick in pickup share came as good news to beleaguered Detroit-based auto makers, which still owned 86.1% of the market in August. This was especially true at Ford Motor Co. and Chrysler LLC, both of which will introduce extensively redesigned products to the segment this year. “Obviously, on the light-duty side, the segment has shrunk and will remain contracted, but it is still a robust segment,” says Joe Veltri, director of truck product marketing at Chrysler. “It’s still the industry’s third-largest segment. 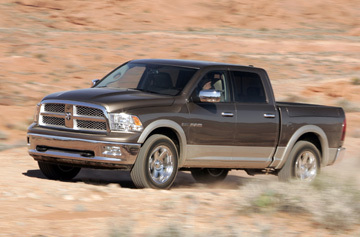 “We might be losing some non-traditional buyers over fuel economy, but the mainstream pickup buyer is still there,” Veltri says in a telephone interview from Miami, where he is conducting a regional rollout of the new Ram. GM posted its best truck month of the year in August, leading the auto maker to believe the segment might be stabilizing. The Chevrolet Silverado and Avalanche and GMC Sierra witnessed their strongest sales totals in 12 months, although pickup sales remained down year-over-year and a juicy employee pricing incentive helped lure customers to dealers. “We’re not planning for the truck market to snap back, but we think we saw the bottom three or four months ago,” Mark LaNeve, vice president-sales, service and marketing at GM North America, tells journalists in his monthly conference call. Others industry experts take a more pessimistic stance on the segment. Through the first eight months, sales still trailed like-2007 by 25.0%. George Pipas, Ford’s top U.S. sales analyst, points to an average incentive of $7,000 per unit as an overriding contributor to the segment’s upward trend. Pipas thinks the fullsize-pickup segment likely will reach 1.6 million units this year, down from a high of 2.5 million in 2004 when the current-generation F-150 was launched. However, he also estimates the industry could sell a mere 13 million light vehicles this year. According to Ward’s AutoForecasts, U.S. light-vehicle sales this year will total between 14.3 million and 14.6 million units, which would mark the weakest finish since 1993. CSM Worldwide predicts the segment’s volume will shrink further and reach bottom in 2010, despite launches of the all-new Ram and F-150, which Ford pushed back from an August timetable to October to clear out ’08 inventories. According to CSM, average home prices, which already are down 10% from their peak, may fall another 13% before returning to the stable growth trend of the 1990s. “New products may help Ford and Dodge hold market share, but (it) won’t be enough to turn the tide,” says Joe Barker, CSM’s senior manager, global sales analysis. North American fullsize-pickup output this year likely will total 1,560,234 units, or 12.0% of total light-vehicle production, according to Ward’s AutoForecasts. Next year, it should drop to 1,394,591, and decline further to 1,293,924 in 2010 before undergoing a slight rebound to 1,366,003 in 2011. Global Insight’s Magliano disagrees. He sees the recent mix shift as a reflection of some consumers realizing a small car may not be the correct vehicle for them, despite the fuel-economy savings and a pile of cash on a pickup’s dash. “Part of it is bargain-basement pricing, but even in June bargain-basement pricing would not have moved (pickups),” he says. When fuel costs began rising sharply, “everyone thought there was going to be this big shift to a much smaller mix, one that looked more like Europe,” Magliano says. Nonetheless, he warns, the fullsize-pickup segment will never return to its glory days, highlighted by a peak 14.8% market share in 2004 vs. 13.6% for small cars. Today, small cars outsell fullsize pickups by a 74.8% margin, with 1,929,275 small cars delivered through August compared with 1,103,702 fullsize pickups, according to Ward’s data. That’s fine with Veltri as he launches the new Ram, which soon will boast a 2-mode hybrid version and an optional Cummins diesel engine to hopefully woo some casual buyers back. Chrysler began Ram shipments four weeks ago, and Veltri reports positive feedback from dealers, noting 26,000 orders already have been placed. However, this spring’s shift away from trucks likely spells an end to body-on-frame midsize SUVs and probably accelerates a movement to unibody designs. Ford, for instance, has said its next-generation Explorer will make the switch.